Bu araştırmanın amacı Sıkıntıyı Tolere Etme Ölçeği Türkçe formunun geçerlik ve güvenirliğini incelemektir. Araştırmaya 327’si kız ve 221’si erkek olmak üzere 548 üniversite öğrencisi katılmıştır. Öncelikle ölçeğin dilsel eşdeğerliği incelenmiş ve dilsel eşdeğerliğe sahip olduğu görüldükten sonra geçerlik ve güvenirlik analizleri yapılmıştır. Ölçeğin yapı geçerliği için uygulanan doğrulayıcı faktör analizi sonucunda 15 madde ve dört alt boyuttan (dayanıklılık, yoğunlaşma, değerlendirme ve düzenleme) oluşan modelin iyi uyum verdiği bulunmuştur (x²=316.43, sd=84, p=0.00, RMSEA=.071, NFI=.94, CFI=.95, IFI=.95, RFI=.92, GFI=.93 SRMR=.053). Ölçeğin faktör yükleri .27 ile .72 arasında değişmektedir. STÖ’nün alt boyutlarının iç tutarlılık güvenirlik katsayıları ölçeğin bütünü için .82, dayanıklılık alt ölçeği için .62, yoğunlaşma alt ölçeği için .66, değerlendirme alt ölçeği için .71 ve düzenleme alt ölçeği .61 olarak bulunmuştur. Ölçeğin test-tekrar test güvenirlik katsayıları ölçeğin bütünü için .63, dayanıklılık alt ölçeği için .60, yoğunlaşma alt ölçeği için .62, değerlendirme alt ölçeği için .64 ve düzenleme alt ölçeği .58 olarak bulunmuştur. Ölçeğin düzeltilmiş madde toplam korelasyonları .25 ile .59 arasında sıralanmaktadır. Bu sonuçlara göre STÖ’nün Türkçe formunun eğitim ve psikolojide geçerli ve güvenilir bir ölçme aracı olduğu söylenebilir. The aim of this research is to adapt the Distress Tolerance Scale to Turkish and to examine its psychometric properties. The research was conducted on 548 university students. Results of confirmatory factor analyses demonstrated that this scale yielded four factors (tolerance, absorption, appraisal, and regulation), as original form and that the model was well fit (x²=316.43, df=84, p=0.00, RMSEA=.071, NFI=.94, CFI=.95, IFI=.95, RFI=.92, GFI=.93 and SRMR=.053). Internal consistency coefficients of four subscales were .62 for tolerance subscale, .66 for absorption subscale, .71 for appraisal subscale and .61 for regulation subscale. The overall internal consistency coefficient of the scale was .82. The test-retest reliability coefficients were found as .63 for overall scale and as .60 for tolerance subscale, .62 for absorption subscale, .64 for appraisal subscale and .58 for regulation subscale. The corrected item-total correlations of DTS ranged from .25 to .59. Overall results demonstrated that this scale can be used as a valid and reliable instrument in education and psychology. Anestis, M. D., Selby, E. A., Fink, E., & Joiner, T. E. (2007). The multifaceted role of distress tolerance in dysregulated eating behaviors. International Journal of Eating Disorders, 40(8), 718-726. Anestis, M. D. (2011). Affective and behavioral dysregulation: An analysis of individual difference variables in the acquired capability for suicide. Unpublished doctoral dissertation, The Florida State University College of Arts And Sciences. Beauvaıs, F. ve Oettıng, E. R. (1999). Drug Use, Resilience, and Myth of the Golden Child. In M. D. Glantz ve J. L. Johnson (Eds.) Resilience And Development: Positive Life Adaptations (pp.101- 107). New York: Kluwer Academic / Plenum Publishers. Brandon TH, Herzog TA, Juliano LM, Irvin JE, Lazev AB, Simmons VN. Pretreatment task persistence predicts smoking cessation outcome. Journal of Abnormal Psychology. 2003;112:448–456. Brockman, C. J. (2009). Urgency and distress tolerance predicting alcohol use, alcohol-related problems, and alcohol use as a coping mechanism. Unpublished master’s thesis, University of Central Missouri. Brown, R. A., Lejuez, C. W., Kahler, C. W., & Strong, D. (2002). Distress tolerance and duration of past smoking cessation attempts. Journal of Abnormal Psychology, 111, 180-185. Brown RA, Palm KM, Strong DR, Lejuez CW, Kahler CW, Zvolensky MJ, et al. Distress tolerance treatment for early-lapse smokers: rationale, program description, and preliminary findings. Be- havior Modification. 2008;32:302–332. Büyüköztürk, Ş. (2004). Veri analizi el kitabı. Ankara: Pegem A Yayıncılık. Büyüköztürk, Ş., Akgün, Ö., Kahveci, Ö., & Demirel, F. (2004). Güdülenme ve Öğrenme Stratejile- ri Ölçeği’nin Türkçe formunun geçerlik ve güvenirlik çalışması. 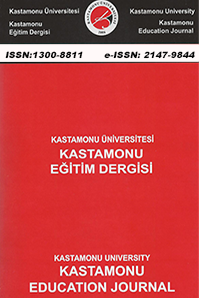 Kuram ve Uygulamada Eğitim Bilimleri, 4(2), 207-239.
Cooper, M. L., Russell, M., Skinner, J. B., Frone, M. R., & Mudar, P. (1992). Stress and alcohol use: Moderat- ing effects of gender, coping, and alcohol expectancies. Journal of Abnormal Psychology, 101, 139-152. Ercan, Ö. (2009). İlköğretim okulu öğrencilerinin aile özellikleri, öğrenilmiş çaresizlik düzeyleri ve stresle başa çıkma yolları. Yayınlanmamış yüksek lisans tezi. Dokuz Eylül Üniversitesi Eğitim Bilimleri Enstitüsü. Hu, L. T., & Bentler, P. M. (1999). Cutoff criteria for fit indexes in covariance structural analysis: Conventional criteria versus new alternatives. Structural Equation Modeling, 6, 1-55. Huang, K., Szabo, M., & Han, J. (2009). The relationship of low distress tolerance to excessive worrying and cognitive avoidance. Behavior Change, 26(4), 223-234. Linehan, M. M. (1993). Cognitive-behavioral treatment of borderline personality disorder. New York: Guilford Pres. Madeley, M. C. (2009). Distress tolerance and eating expectancies as moderators of the relation- ship between interpersonal stress and dis-inhibited eating. Unpublished master’s thesis, Uni- versity of Texas at Austin. Morris, C. G. (2002). Psikolojiyi anlamak: Psikolojiye giriş. (Çev. Ayvaşık, H.B. & Sayıl, M.). Ankara: Türk Psikologlar Derneği Yayınları No 23. Nelson, G. (1990). Women’s life strains, social support, coping, and positive and negative affects: Cross-sectional and longitudinal tests of the two-factor theory of emotional well-being. Journal of Community Psychology, 18, 239-263. Nock, M. K., & Mendes, W. B. (2008). Physiological arousal, distress tolerance, and social problem-solv- ing deficits among adolescent self-injurers. Journal of Consulting and Clinical Psychology, 76, 28-38. Stipelman, B. A. (2008). A comprehensive assessment of distress tolerance as a predictor of early smoking lapse. Unpublished doctoral dissertation, Faculty of the Graduate School of the University of Maryland. Vorous, M. A. (2008). The effects of experiential avoidance and distress tolerance on self-harm in individuals diagnosed with borderline personality disorder. Unpublished doctoral dissertation, Alliant International University. West, R. J., Hajek, P., & Belcher, M. (1989). Severity of withdrawal symptoms as a predictor of outcome of an attempt to quit smoking. Psychological Medicine, 19, 981-985. Williams, J. C. (2010). Construct validation of experiential acceptance: A multi-trait monomethod approach. Unpublished doctoral dissertation, Graduate School of Binghamton University. Witte, T. (2010). Impulsivity, affective lability, and affective intensity: Distal risk factors for suicidal behavior. Unpublished doctoral dissertation, The Florida State University. ISNAD AKIN, Ahmet , AKÇA, Mehmet Şirin , GÜLŞEN, Mahir . "SIKINTIYI TOLERE ETME ÖLÇEĞİ TÜRKÇE FORMU: GEÇERLİK VE GÜVENİRLİK ÇALIŞMASI". Kastamonu Eğitim Dergisi 23 / 2 (May 2015): 619-630.